Research In Motion’s sad decline is having all manner of ill effects on the company’s long-suffering developer community. Disillusioned with repeated delays to RIM’s next-generation BlackBerry 10 operating system and the company’s ebbing smartphone market share in the U.S., some are throwing up their hands and turning away from the platform. 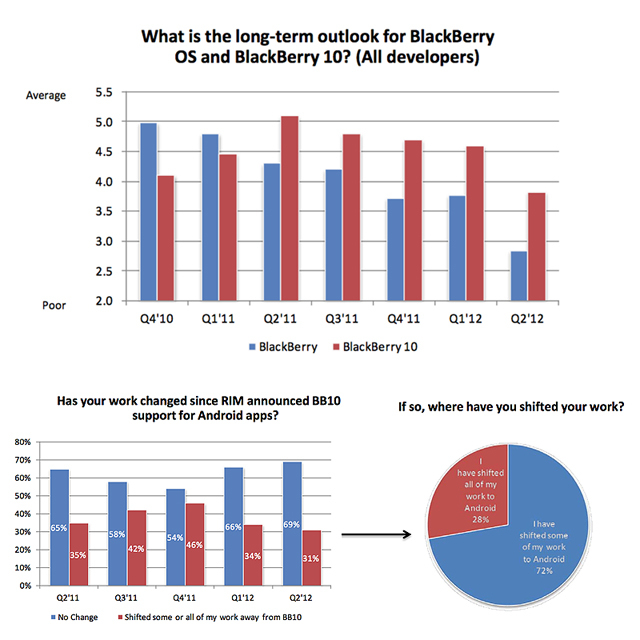 To wit, a new survey of developers by Baird Equity Research which finds dev sentiment toward BlackBerry 10 and BlackBerry 7 in general at a new low. Baird surveyed 200 developers culled from a sample set of 4,300 and found that their collective outlook for BlackBerry 10 — charted on a 10-point scale from poor to excellent — had fallen to 3.8 from 4.6 in the previous quarter. 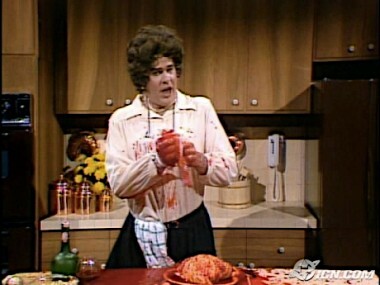 Meanwhile, their outlook for the BlackBerry 7 declined to 2.8 from 3.8. To put those numbers in perspective, consider this: The respondents’ outlook for Google’s Android is 8.7, and their outlook for Apple iOS is 9.3. At 2.8, devs’ outlook for BlackBerry 7 is only slightly better than their view of Hewlett-Packard’s not-quite-abandoned webOS, which still managed to rate a 2.1. 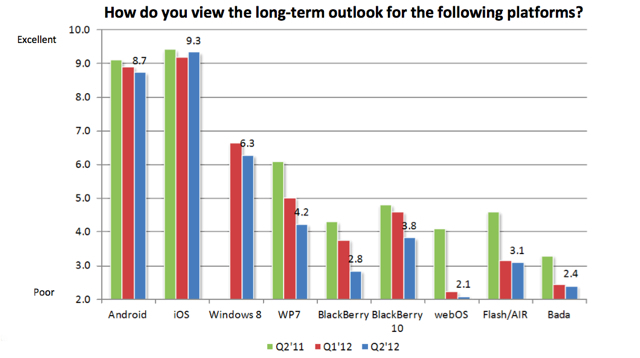 And at 3.8, the outlook for BlackBerry 10 is hovering in the same range as Adobe’s Flash/Air platform. Not exactly encouraging data points. And there are others that are more ominous still. While there’s some comfort to be found in the idea of a small but increasingly loyal developer base for BlackBerry 10, two consecutive quarters of 30 percent declines in its membership is a foreboding sign indeed for a platform that’s purportedly six months away from launch. 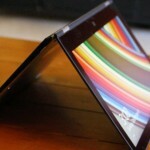 RIM’s potential for a turnaround is crumbling before our very eyes. And it’s getting harder and harder to watch. Baird isn’t the only research outfit charting a decline in developer sentiment toward BlackBerry. According to IDC/Appcelerator’s latest Mobile Developer report, developer interest in BlackBerry declined from 20.7 percent in Q4 2011 to 15.5 percent in Q1 2012. 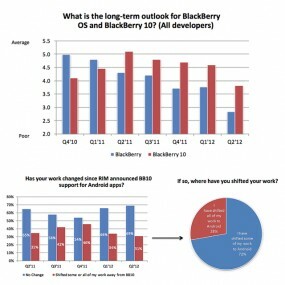 RIM, for its part, disputes the notion that its developer base is in decline. Speaking with AllThingsD, a spokesperson noted that the company’s app vendor base has grown 157 percent in the last year and that its BlackBerry 10 Jam World Tour has seen over-capacity registration in almost every city. 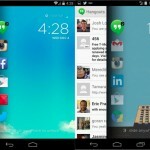 RIM also called attention to its recent announcement that more than three billion applications have been downloaded from BlackBerry App World, something we covered here last week. 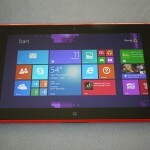 71 percent of developers surveyed said the announcement of Windows Phone 8 three weeks ago increased their interest in the platform, while 64 percent said they were enthusiastic about Microsoft’s new Surface tablet. 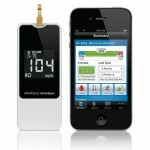 78 percent of iOS developers expect Apple to eventually launch an HDTV. 62 percent of developers surveyed said that most of their tablet-specific downloads come from Samsung; 23 percent said Amazon’s Kindle Fire was their top device for downloads. UPDATE: Alec Saunders, RIM’s VP Developer Relations, responds at length to the Baird survey in a new post to the company’s Developer Blog entitled, Bleeding Developers? Far from it.